I graduated from Athens State University in Athens, Alabama where I received my bachelors degree. I am currently working on my graduate degree through Murray State University. 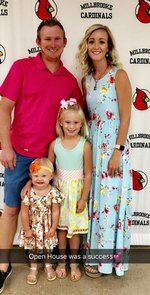 I am proud to say that this is my eighth year teaching elementary math in Christian County and I am beyond happy to be a Millbrooke Cardinal! Hi everyone! I am so excited about starting this brand new school year! I am looking forward to getting to know each and every one of you. With that being said, I would like to take just a minute and introduce myself. My name is Ashlie Ezell and I am from Falkville, Alabama. I moved to Christian County in 2011 and live with my husband and our two sweet daughters, Talyn and Emersyn. I am so very blessed to be a part of you and your child's educational experience. My door will ALWAYS be open! Roll Tide! !